Grandma Martha made the trip across the pond and brought along Cora's brother Harold, played by heavy hitter Paul Giamatti. Shirley MacLaine could hardly show up with just anyone on her arm. While the latter didn't do much this time in England, Harold made an impact. If ever the series makes a move to America with Tom taking Sybil to a new life, there is a lot of material they could mine with the Levinsons and the actors on board playing the family. 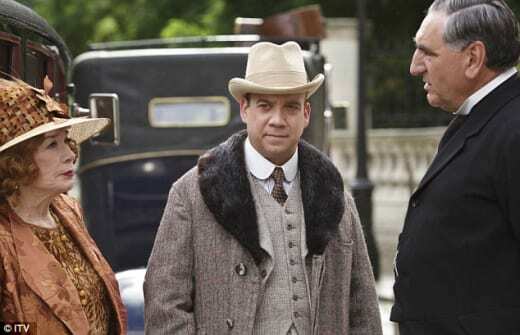 A spinoff out of England would be difficult given the U.S. doesn't have the historical locations available that they're used to shooting with on Downton, but it would be interesting to see the family continue on in the States. Harold wasn't eager to visit England but by the time he left the country and its people had won him over. He even wanted to take Daisy back to America with him he so enjoyed her cooking -- almost as much as his valet Ethan fancied Daisy herself. Daisy was finally on the receiving end of some much-deserved male attention. Even though it wasn't reciprocal, it gave her a spring in her step and the confidence to send Ivy away with her suitor in her stead. That's right -- it appears we are finally done with the insufferable Ivy. If the letters from Alfred continue, it wouldn't surprise me one bit if Daisy eventually found her happy ending with the man she had the guts to turn away. He's making an honorable living in London at The Ritz, Daisy is chuffed at receiving attention and friendships can always change down the road. Nobody knows more about the nature of changing relationships better than Mary. Still not certain who the right man for her might be, she wavered for many different reasons before those offering their hands. It was surprising to learn at one point she felt she might be a burden to Charles Blake as his star seemed to be rising while hers was on the way down. It's not all about the money, after all. As much as I have been leading the charge for Blake to win the race (and continue to do so), Tony Gillingham setting Mary straight about Blake's true place in society was quite admirable. With the competition already very stiff, he didn't hold back information that made Blake look even better in Mary's eyes -- Blake is set to inherit one of the largest estates in Ulster. Of course this changed things, but not for reasons expected. Mary felt as if she and Blake would come to things more equally if they shared a similar plight -- not monetarily, but with respect to their circumstances in society and trying to run an estate. When she asked why he never mentioned it, he admitted he hoped she would choose him based solely on his other merits. More cards in the deck were immediately stacked in his favor, don't you think? Edith returned to Downton after eight months away, deciding to wean her baby daughter before giving her up. Clearly she was attached and unsure of her decision. She learned Michael Gregson got into a fight his first night in Munich and that's when he went missing. He's likely presumed dead. After a conversation with Tom about how they are different than everyone else in the family, Edith realized her daughter didn't belong in Switzerland any more than she did. Is there any doubt Edith will eventually come out of the closet as an unwed mother? Edith has been a feminist from the start and it would be highly unlikely she'll stop that train now that it's roaring down the tracks. Sybil would be quite proud of her big sister. Thomas Barrow, unable to get the extraordinarily large chunk of wood out of his behind, has found his latest annoyance -- that he is required to call Tom Branson sir when if Tom hadn't fallen in love with and married Sybil he would be below him in the household rank. Enough already. It's time for a chandelier to fall on his head, a horse to trample him or for Bates to trip him while he's on the street in York so he tumbles in front of a lorry. He's old and unwelcome news. Meanwhile, the mystery of Bates may never be solved. Mary and Mrs. Hughes grappled with what to do once they found confirmation of Bates' presence in London on the day of Green's death, but they never really came to any conclusion. When a man is willing to do just about anything for you, it's difficult to turn your back on him. Upon Bates' assistance in clearing things up with the Prince of Wales' affair, Mary came to that realization and threw the evidence into the fire, apparently content to let the issue die. Whether it come back to haunt Bates or the family we'll find out in the future. It was cute watching Mrs. Hughes trying to subliminally persuade Carson to choose a day at the beach for the staff's day out. To Carson, that option was an utter failure when they could be doing things like visiting museums and Westminster Abbey. He's a bit dull until he gets some fresh air. 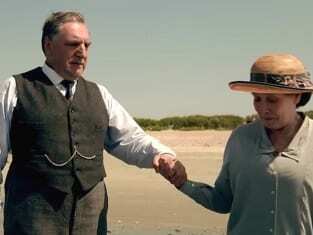 Closing out Downton Abbey Season 4 with the staff at the seashore, out of their formal attire and enjoying each other as friends was a perfect ending. That's where Daisy learned of Ethan's feelings for her and got rid of Ivy and Bates and Anna looked gloriously happy for a change. Mr. Carson, usually so stuffy and formal, finally rolled up his pants and put his feet into the water. The connection we've been witnessing between him and Mrs. Hughes grew a little deeper as they flirted, grasped hands and agreed they always had each other to lean upon. Mrs. Hughes: You can always hold my hand if it will make you feel a bit steady. Carson: I don't know how, but you managed to make that sound a little risque. Mrs. Hughes: And if I did, we're gettin' on Mr. Carson, you and I. We can afford to live a little. Permalink: And if I did, we're gettin' on Mr. Carson, you and I. We can afford to live a little. It was a beautiful moment and a high note to carry the story forward into Downton Abbey Season 5. If you want to relive any of this season or last, watch Downton Abbey online to get your fix of all the glorious costumes and brilliant colors from the award-winning series. What story did you most enjoy?